If you shoot pictures with a digital single-lens reflex (SLR) camera and carry a point-and-shoot for its video capability, then Nikon’s D90 might be the camera for you. The successor to Nikon’s excellent D80, the D90 also allows you to shoot high-definition 720p video. The real significance of video on a SLR is not the ability to shoot simple YouTube-style clips (though the D90 is quite suitable for that purpose), but the flexibility to use high-quality lenses to get cinematic effects that you can’t achieve with a camcorder. In this regard, the D90 is a potential boon to digital filmmakers, though you’ll have to jump through some hoops to take advantage of the camera’s video features. For the most part, the D90 does not look significantly different from the D80, though it is a tiny bit heavier. As with its predecessors, the D90 represents the middle ground of Nikon’s consumer SLR line. With a 12 megapixel sensor (up from 10 on the D80), the camera packs a tremendous number of features, which will satisfy serious shooters and give novice photographers plenty of room to grow. 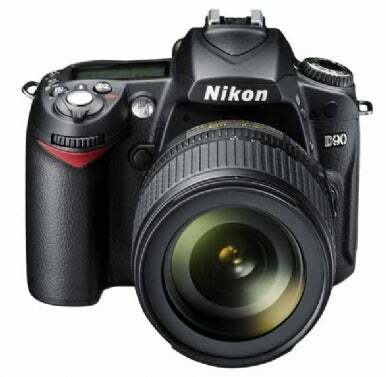 The D90 has a 3-inch, 920,000-pixel LCD; Nikon first used this LCD on the D300 ( ). This LCD is exceptional, and while it’s still not good enough to accurately gauge focus, its brightness and clearness is a joy to work with. ISO sensitivity for the D80 was 100 to 1600; that’s been improved to 200 to 3200 on the D90, with a special boost feature that lets you achieve a slower ISO 100 and a faster ISO 6400. Burst speed has been increased from 3 fps on the D80 to 4.5 fps on the D90, and the D90 also has an improved servo focus, which tracks a moving object and keeps it in focus. The D80 included an Image Dust Off feature, which allowed you to shoot a dust “reference” picture that could be used by Nikon’s software to remove dust spots from your image. The D90 also includes this feature, but adds a sensor cleaning mechanism to the camera. When you power the camera up or down, the D90 vibrates its sensor to shake off dust. This is a fairly common feature on SLRs now, and it definitely does help reduce dust troubles, so it’s a welcome addition to the D90. Nikon has expanded the Picture Controls feature (preset image processing parameters that allow the camera to adjust JPEG images in-camera) by allowing you to define custom Picture Controls using bundled software. This is a nice addition for tailoring the camera’s processing to very specific conditions, though this feature is really only worth the trouble if you are a high-volume, fast-turnaround shooter. The rest of us can simply edit our images as we need. While point-and-shoot camera users are accustomed to using their camera’s LCD as a viewfinder (and often have no other choice), LCD Live View on SLRs is still fairly recent. The D90 packs a Live View mode; activate it, and you can use the camera’s LCD screen as a viewfinder. However, as with most SLR Live View modes, there are some caveats to bear in mind. During Live View, the camera must flip up its mirror--the mirror that normally feeds light to the optical viewfinder--to expose the sensor in order to create an image for the LCD. Unfortunately, the autofocus sensors are up near the viewfinder, so when the mirror flips up, the camera loses its autofocus capability. The D90's LCD is much improved over the LCD in the camera's predecessor, the D80. This means that, to calculate focus, the camera has to analyze the image that it’s seeing. This takes much longer than normal autofocus, so when working with Live View you’ll need to anticipate your focus concerns and adjust your shooting technique accordingly. Live View is a great feature for any time when you need to shoot over your head, or down low, or in any other situation where your camera position makes looking through the viewfinder impossible. Live View also makes for more relaxed tripod-mounted shooting. While the D90 is an excellent still camera, the biggest buzz around it stems from its ability to shoot high-definition 720p video at 24 frames per second. The video feature is easy to use, but if you’re accustomed to shooting video with a point-and-shoot camera, you’ll have to think a little differently. Unlike a point-and-shoot camera, the D90 does not continuously autofocus when shooting in movie mode--it can’t, for the same reason that it can’t quickly autofocus in Live View. This means that if you and your subject move closer to each other, your focus will be wrong, which can make casual shooting much more difficult than it is with a point-and-shoot. You can focus manually, though, and try to keep your subject in focus as you pan and move the camera. One thing to bear in mind is that the microphone in the camera’s body picks up any sounds that your hands make when touching the camera, so a lot of camera handling (such as turning a focus ring) can make for a lot of clunking and thunking sounds in your audio track. Unfortunately, the D90 lacks an external microphone jack, which limits its use for recording interviews and other video podcasting-type situations. What’s compelling about the D90’s video capability is the shooting flexibility provided by the Nikon lens system. From wide-angle and fisheye lenses to long telephoto lenses and perspective-distorting tilt/shift lenses, the same lens options that make for flexible still shooting with an SLR allow you to shoot with lenses that you’d never find on a video camera. One of the big advantages that film movie cameras have always had over digital camcorders is the option to shoot with very shallow depth of field. By blurring out the background of a shot, a cinematographer can bring more attention to a subject, and create beautiful blurry backgrounds. Since most consumer camcorders lack a manual iris control, and since very few camcorders offer very wide apertures, such depth of field control has not been possible for most video shooters. With the D90 and the right lens, this is no longer the case. Unfortunately, “the right lens” is probably not one that you already have. The D90 lacks any manual exposure control when shooting video, which means you have no way to actually specify an aperture. But, if you use a Nikon lens with a manual aperture control, you can dial in any aperture you want, and achieve the type of precise depth of field control that you can’t get with a normal video camera. If you’re serious about video, a D90 and some used lenses can provide an incredible amount of creative video power. It will also take a fair amount of skill to operate. You’ll have to work just like a movie camera cinematographer, and take very special care with focus distance and exposure choice, but the results can be worth the extra effort. The other great advantage of shooting video with an SLR like the D90 is its exceptional low-light performance when shooting at high ISO. Dial the D90 up to ISO 1600, put a fast lens on it, and you can shoot in extremely low light. While the D90’s video capability tends to draw the most attention, it’s important not to forget that it shoots exceptional still images, and scores over the D80 with its high ISO performance. The lower ISOs are mostly unchanged because they were already so noise-free, but the higher ISOs (1600 and up) are definitely cleaner, making the D90 an exceptional low-light camera. Video quality is very good, though some might be frustrated that the D90 doesn’t shoot full 1080p video. For most applications, though, the D90’s 720p will be fine. You must be very careful not to pan the camera quickly, or you’ll get a “rolling shutter” artifact, where the top of the frame will appear to pan at a different speed from the bottom. Fast-moving objects can also suffer from this issue. First and foremost, the D90 is a still-image SLR, and a very good one. With its very good feature set, excellent image quality, and reasonable price, the D90 is a camera you should absolutely consider if you’re shopping for a mid-range SLR. If you’re a video shooter, it’s not a substitute for a video camera. The rolling shutter issues, lack of external mic jack, and lack of continuous autofocus mean it pales when compared to a comparably priced HD camera. But if you’re a filmmaker who wants an affordable video solution, with the option to shoot with a film-like level of control, then the D90 is a very compelling option.